Y’all. Ernest J. Gaines is back with his first book in over ten years. For those who think his name sounds familiar, he is the genius behind A Lesson Before Dying, A Gathering of Old Men, and The Autobiography of Miss Jane Pittman. In other words, he is one of the very best around. Since I read my first book by him in high school, then another in college, and then taught one of his books to my students, I have always held a deep appreciation for his style, his characters, his settings, his use of dialect, his words, and his themes. 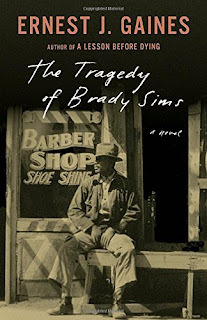 And, his newest novella, The Tragedy of Brady Sims, is no different. Well, except for the fact that it is a novella instead of a book. But, this will make all the people (especially the students) rejoice! In a little more than one hundred pages, readers will be transported to a black barber shop in Louisiana where they will learn all about the life of Brady Sims. You see, this is the genius of Gaines. He is able to tell a whole story within a few pages mainly in one setting – a barber shop. His use of characterization, but most importantly, the way he brings the character’s dialogue to life with brilliant dialect and colorful idioms, set him apart from other writers. When you read this novella, you will feel as if you are sitting in the barber shop listening to the men reminisce about the main character and their town. Also important is the theme. Gaines has always handled race issues with honesty and grace. In this case, the story opens with a father shooting his son in the courtroom after his son was sentenced to prison in Angola (the historically brutal prison in Louisiana). After the shooting, the white sheriff then gives Brady Sims two hours before he will pick him up to take him to jail. So, the story revolves around two things. First, why did Brady Sims shoot his son? Second, why did the cop let him leave the courthouse after the shooting and give him two hours before he picks him up? In this story, the theme delves into race issues within society and the justice system. Who does the system help and who does it fail? I cannot recommend reading a novel by Ernest Gaines enough, but if this is your first time entering his world, this novella is the perfect start. New fans and old fans alike will be happy with the latest from this living legacy.